DENVER – Grab your camera gear and follow this guide for a full Mile High experience from dusk till dawn. These 20 spots “scream” Denver and include natural phenomenon, unique architecture, cultural creations and engineering exploits. The list is divided into two parts, so choose the route that best suits your schedule. Each tour takes about four hours and has been mapped out on our Google map making it easy to navigate from location to location from any smartphone. The first tour is a four-mile walking route in downtown Denver that loosely circles the 16th Street Pedestrian Mall, starting at the Dancing Aliens, up to the Highlands, then ends at the steps of the Colorado Capitol Building. Google says you’ll want to spend at least three hours on this tour, plus save time to enjoy some of Denver’s fine food and beverage establishments. Road trip! Get in the car or grab an Uber for the second tour, a 150-mile photography loop. 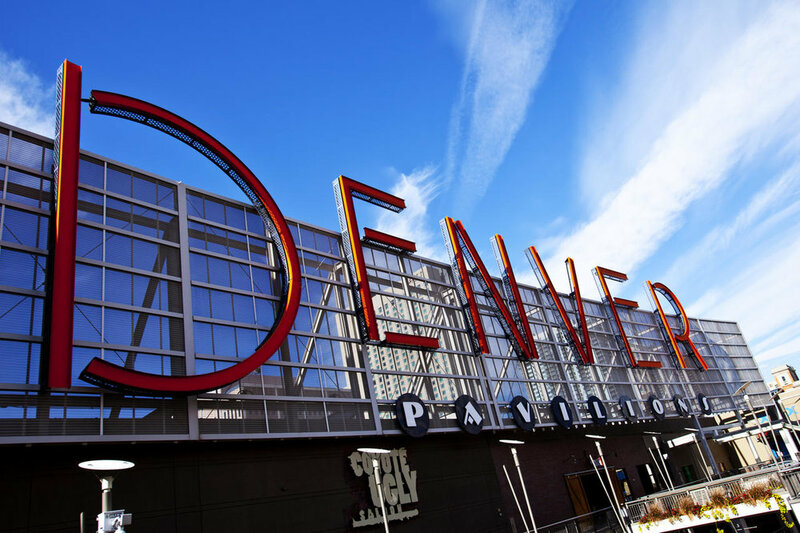 Starting in downtown Denver, you’ll circle the metro area, cruise along the foothills and end at Red Rocks Amphitheater. The journey takes about three hours from start to finish, if you’re focused. Or stretch the journey with stops at restaurants, breweries and distilleries that dot the route to round out an epic day of photography. The Denver Performing Arts Complex (DPAC) is one of the largest performing arts complexes in the world. It spans four blocks and houses eight performance spaces. Bringing the buildings together is a tiled, glass ceiling that creates an atrium affect high above the common area at street-level. 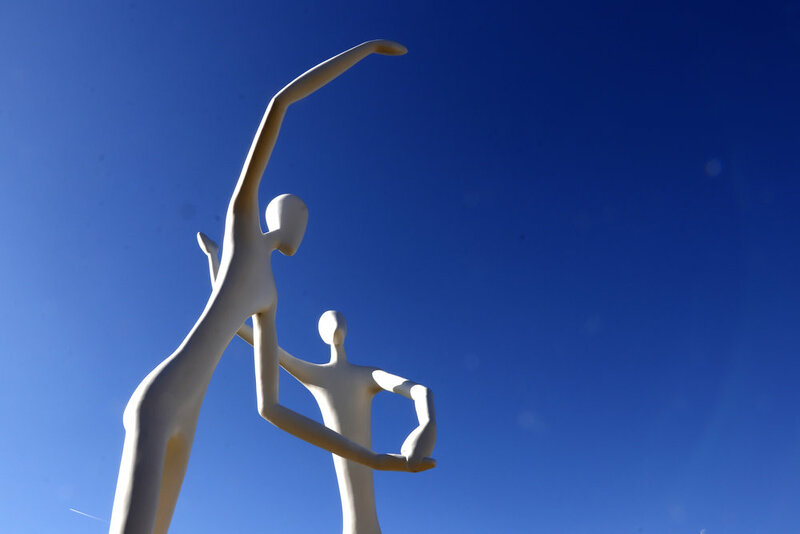 The 60-foot dancing aliens, officially named “Dancers,” are ever-present in the open space at the west entrance to the DPAC. This is where Denver began. Streams of lights sway above the one-block expanse of historic buildings that line Larimer Street between 14th and 15th Streets in Larimer Square. Since the mid-1800s, it has been a place where people gather, complete with saloons, restaurants, homes and retail offerings. The meeting point of the South Platte River and Cherry Creek is an urban water experience connecting miles of concrete paths along each of the waterways for walkers and cyclists. Kayakers and swimmers can spend time enjoying the water when the weather allows, and both sides of the water are perfect for picnics with great architectural features worthy of photographing. In the Highlands neighborhood across Interstate 25 from Denver’s city center is a pop art building in the shape of a vintage milk can where you can buy ice cream and nostalgic treats. 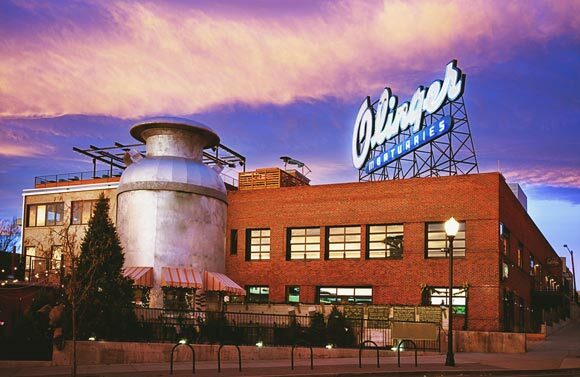 The Little Man Ice Cream shop sits adjacent to the vintage, neon Olinger Mortuary sign that now reads just “Linger.” The Highlands is connected to downtown Denver by a pedestrian bridge over the interstate where skyline photos can be made, especially at sunrise and sundown. This landmark, cable-suspension footbridge with its 200-foot steel, tapered mast was completed in 2002 at the time Denver was revitalizing its lower downtown area, aka LoDo. The bridge extended the 16th Street Pedestrian Mall to connect Commons Park and Riverfront Park. It crosses over the railway giving residents and visitors access to recreation and retail on the other side of the tracks. Touted by developer Dana Crawford as “Denver’s Living Room,” the remodel of Union Station has reignited a transportation and community hub. The glorious “Great Hall” is once again full of laughter, life, libations and goodies. Both the recently renovated building and the addition of the new transit station to its northwest are architecturally intriguing designs for transportation. Amtrak, buses, taxis, Ubers, pedi-cabs and light rail join forces to move people around the city. 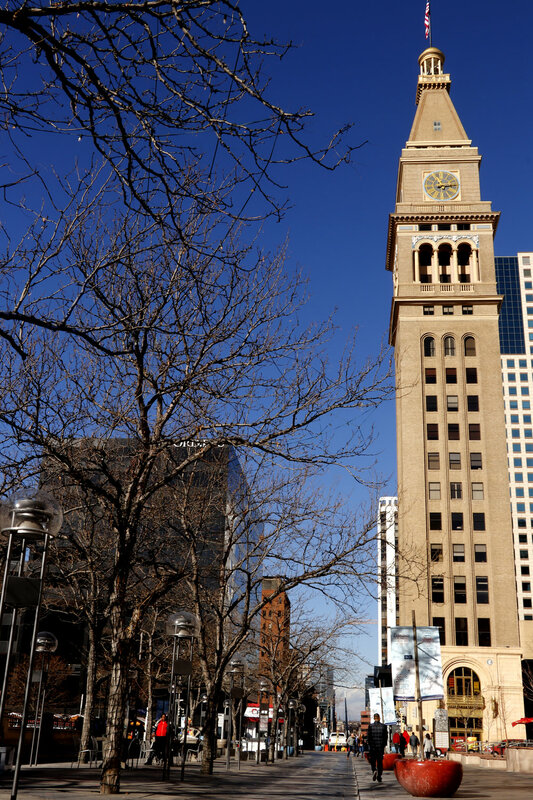 Denver’s first skyscraper was finished in 1911, the tallest building in the U.S. at the time at 325 feet. The 20-story tower with its four-face clock and belfry, is commonly known as the Daniels and Fisher Tower. It was named from the once adjoining Daniels and Fisher Department Store that was popular during the economic boom of the early 20th century. The tower is a hallmark of Denver’s 16th Street Pedestrian Mall. Denver’s iconic “I See What You Mean” blue bear statue stands outside of the Denver Convention Center and peers into the east lobby through its towering wall of windows. It adds a whimsical component for visitors and locals alike. For extra interesting shots, get inside the building and shoot up at the gigantic 40-foot bear. This is a bold, must-shoot sign, day or night. An iconic location for selfies in the Mile High City, it bridges two buildings together on the third floor of the Denver Pavilions retail mall. Just follow the arrows up the escalators to get close or stand on the corner of the 16th Street Pedestrian Mall to capture its expansiveness. A Denver historic landmark, the gorgeous, graceful and chic 1888 Brown Palace Hotel offers a distinguished, traditional-style scotch and cigar lounge, secret underground tunnels, and serves high-noon tea several days each week. The stone, triangular building’s eight floors of rooms face inward to an open atrium lobby with railings made of ornate wrought iron. The industrial Denver River North neighborhood, dubbed RiNo, added about 85 colorful murals in 30 blocks during the Crush Walls 2018 event that featured artists from all corners of Denver painting underpasses, building walls and more. The murals contribute a lively flavor to the industrial edginess of the area. From the Denver Museum of Nature and Science in City Park, the expansive view spans the entire range from Pikes Peak in the south to Long’s Peak in the north. In the foreground is Duck Lake and Denver’s skyline that includes the Wells Fargo Center, better known as the cash register building because of its shape. The hilltop area was once a cemetery, and in the late 1800s it was turned into a public park for its views of the mountains. The trees are tall and the sky is big upon Cheesman’s vast open lawns. The marble-columned pavilion is home to fashion photoshoots, artistic painting, dancing and weddings. Some say the park is haunted, based on its colorful history. "Many of the bodies left in Prospect Cemetery were those of paupers and criminals," said Jill McGranahan of Denver Parks and Recreation in a 2010 CNN interview. When the cemetery was repurposed, the unidentified remains were moved to another Denver cemetery. The area’s altitude has become synonymous with Denver. 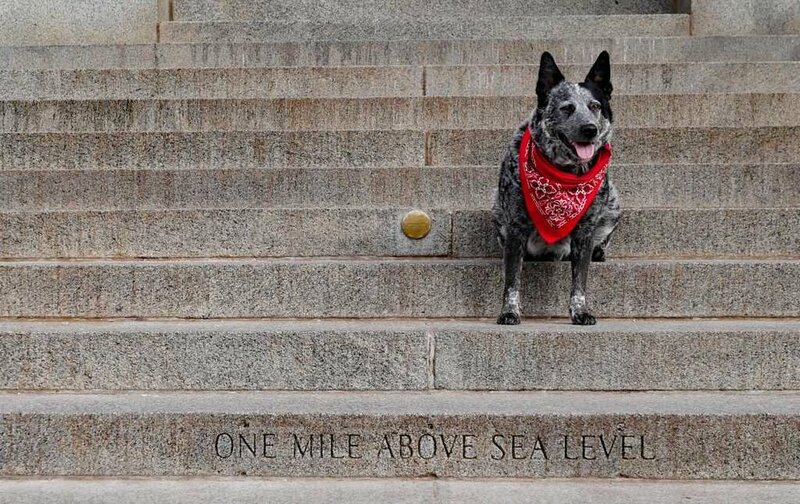 The identifying phrase is carved into the granite step 5,280-feet above sea level at the Colorado Capitol in Denver. 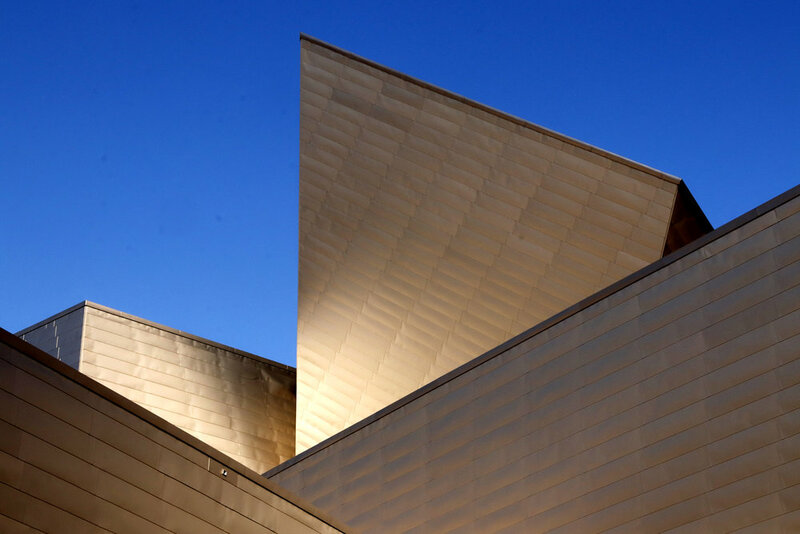 The Hamilton Building, designed by Daniel Lebeskind, features 9,000 titanium panels reflecting both the outlines of the Rocky Mountains as well as the Colorado sunshine. Each moment offers a new perspective as the light changes. From downtown, meander across the Speer Boulevard bridge past the Pepsi Center and Elitch Gardens toward Zuni Street. Stop. Turn around. Snap. For best results, shoot at sunrise or sunset when the backdrop of the sky illuminates the city from behind. On the former site of the Rocky Flats nuclear trigger plant, the horse statue is dressed in a red HAZMAT suit and gas mask representing the dangers the plant had on its workers and the community. Public concern over radioactive contamination continues to flare up at the site on Colorado Highway 72 in Arvada. In 2008, the blue mustang sculpture made by Luis Jiménez was installed at the entrance/exit of Denver International Airport as a tribute to the animal, but reactions from the public don’t always echo this intention. With glowing red eyes, the blue 9,000-pound, 32-foot-tall horse has been dubbed Blucifer. One reason may be because it killed its creator before its completion by falling on him. Welcome to Denver! A Sanctuary Center is a place for quiet reflection in Sedalia south of Denver. Relax and be present within the wishing trees, meditation center, library, and the walkable stone labyrinth. It is open every day from sunrise to sunset. 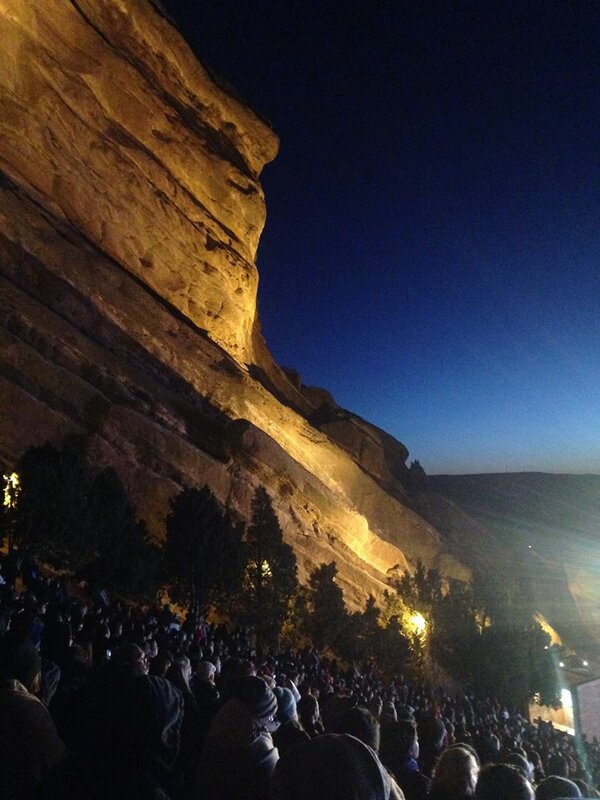 Its website says, “Red Rocks Amphitheatre is a geological phenomenon – the only naturally-occurring, acoustically perfect amphitheater in the world.” The red rock formations cast different shadows as the sun moves across the sky. You can see wildlife, take a hike or just take in the views of the Denver metro area. And, if you are lucky enough to see a show there, you’ll find the acoustic experience to be magical as well. It’s open year-round for visitors, free of charge when no shows are scheduled.